MSD Programmable Electronic Ignition UNIVERSAL - Dezod Motorsports Inc - Home of the automotive performance enthusiast since 2002. 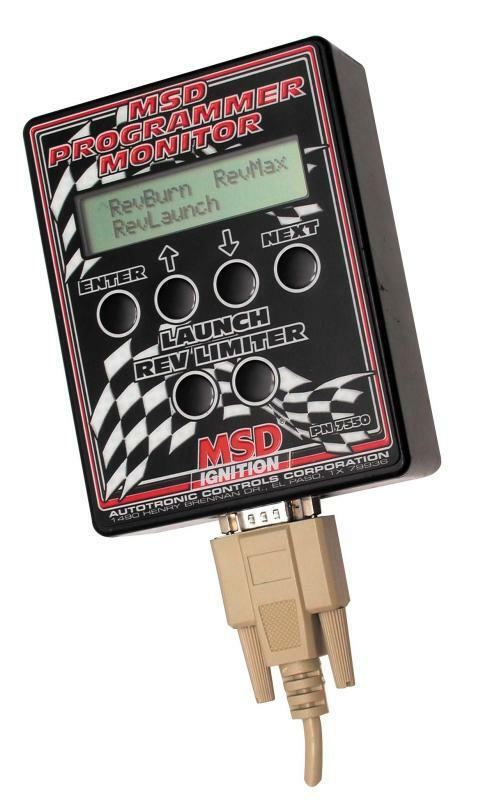 Programmable/Monitor – Part# 7550 – If you do not have a laptop or PC, all of the Programmable 7 Ignition Control’s optional programs can be set with this hand held Programmer/Monitor. This Programmer communicates to the Programmable Ignition via the 9-pin cable. The LCD will display the programming options which you can select to adjust or view the program that is already in the ignition. Adjustments are easily made with six positive-contact push buttons. The unit is easy to handle, even with race gloves on, and weighs in at under half a pound. Dyno Tuning Programmer – Part# 7553 – Taking the time to work with your engine on a dynamometer is a terrific advantage especially when you’re trying to dial-in retard stages and cylinder-to-cylinder timing. This new Programmer has two control dials that provide instant editing of the cylinder-to-cylinder timing, step retards and the start retard values in 0.1° increments. When a change is made it is instantly encoded within the MSD unit and stays in effect until another change is made to that specific program.